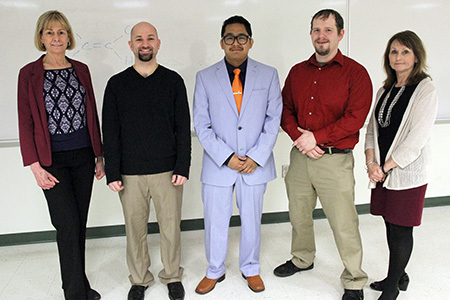 Pictured at the research presentations on March 5 are, from left, Professor of Chemistry Helen Tanzini, students Chris Racioppo, Luis Garcia and John Dodds, and Professor of Biology Diane Hilker. West Windsor, N.J. – The Chemistry and Biology faculty at Mercer County Community College (MCCC) continue to oversee honors research opportunities for MCCC students ready for the challenge. Three students carried out intensive lab projects over winter break in January and shared their findings with fellow students during presentations hosted by the Organic Chemistry Club on March 5. All three students worked with scientists at Genesis Biotechnology Group (GBG) and two of its subsidiaries, Venenum Biodesign and Medical Diagnostics Laboratory. Since 2013, GBG has opened its Hamilton labs to close to 20 Mercer students, a testimony to GBG’s commitment to education and the preparedness of MCCC’s most motivated and curious science students. Mercer’s Honors Science Research Program began in 1999 and has been highly successful in providing specialized research opportunities in chemistry, biology, and, most recently, physics. In addition to area laboratories, the college has partnered with Princeton, Rider and Monmouth universities. To participate, students must have at least a 3.0 GPA in their science classes, be recommended by an MCCC professor, and devote a minimum of six hours per week at the research facility.